An unusual curry tonight. Simple, but very good. The recipe is from Amjun Anand’s Indian Food Made Easy. I bought this to make up the numbers on a book order to get free delivery, which isn’t really the most auspicious start. So, with low expectations and a lack of inspiration on a wet Wednesday evening with nothing in the fridge, and only some frozen fish in the freezer, I settled on a plan, which unlike most of my so-called ‘plans’ actually turned out quite well. North Indian curry is a ‘full-flavoured, tangy and spicy dish – a curry made for Indians’. Well, I’m not Indian, but I’ve had a few curries in my time, so maybe I qualify? Please? 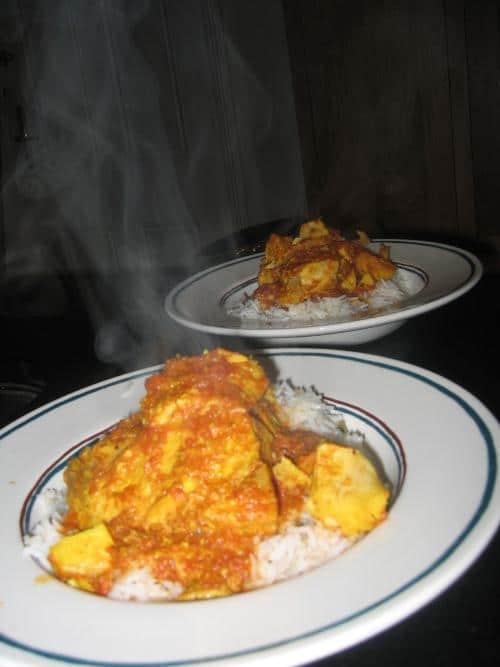 The curry is straightforward, but doesn’t include any onions (had to re-read the recipe a couple of times to make sure. Curry? No onions? A scandal!). A basic masala of garlic, ginger, cumin, pepper, mustard seeds and coriander acts as a base for half a kilo or so of white fish (coley in this case, sustainable, of course..), fenugreek, chilli and turmeric. The sauce is completed with a can of tomatoes. The finished dish was light but quite gutsy and complex, with strong flavours that didn’t overpower – an excellent curry. With some pilau rice, cooked with cardamom, cloves, pepper and cinnamon, this was 20 easy minutes of cooking and a first class result. TV tie-in cook books like this normally make me run a mile, but this is an excellent book with some interesting and easy recipes. More, please.